Tai-Jiang National Park is located on the southwest coast of Taiwan and was established in 2009. The land and sea areas of the park embrace the coastal waters off Tainan City as well as the estuaries of the Qigu River, Zengwen River, Lu'ermen River, and Yanshui River. Also within its 4,905-hectares of land area are the Black-faced Spoonbill Refuge and Qigu Wetlands. The coastal alluvial terrain, old shipping channels, and traditional industries further add to the natural and cultural allures of the park. Visitors can also explore mangrove forests, wetlands, and other ecological and scenic attractions at this emerald Eden on Taiwan's southwest coast. Black-faced Spoonbill Reserve is a reservation area for Black-faced Spoonbill, one almost extinct bird in the world and protected by regulation. Black-faced Spoonbill would fly from Siberia to mouth of Tainan’s Qigu Cengwen River on every Sept. and Oct. and leave on next Mar. to May, thus this period is the best to watch Black-faced Spoonbill in Qigu. Because Black-faced Spoonbill usually takes rest in the daytime and forages at night, they would gather together without any action but play, bathe, or clean feathers for each other at 4:00 or 5:00 pm. If visitors are fortunate, they could watch Black-faced Spoonbill activities by telescope. Actually, besides Black-faced Spoonbill, there are about two hundred kinds of birds ingathering in the mouth of Cengwen River, such as Gull, Snipe, Turtledove, and Chinese bulbul. Generally, visitors could observe more migrant birds in winter. Chi Mei Museum is the private museum of the Chi-Mei Industrial Corporation. The collection is divided into five categories, including western art, musical instruments, natural history, arms and armor, and antiquities and artifacts. The Chi Mei Culture Foundation was established over 20 years ago, and the wealth of the collection encompasses different eras and geographical areas. At present, experts recognize the Chi-Mei Museum as one of the most prestigious private collections in the world. Chihkan Tower (Chikanlou) was built by the Dutch in 1653. It was originally called Provintia. In Dutch, it means eternity. Although Chikanlou has gone through Ming Dynasty, Qing Dynasty, and the Japanese Colonization Period, it basically still maintains its original look. Chinese style building was added to the original Dutch architectural body. Once the place hosted the worship for Guanshihy in Budda. During the Japanese colonization period, Chikanlou was changed to be army hospital. Confucius Temple in Tainan was built in 1666. Confucius Temple has been through more than thirty times of reconstruction, a part of the building was destroyed during the wars or ruined by nature disasters; the present scale of the Confucius Temple was the look after reconstructing during the time when Japanese were ruling (1917). There are fifteen structures inside the Confucius Temple, the primary sacrifices in the palace is to Confucius divine tablet, on both sides, the sacrifices are to the sixteen pupils of Confucius. Inside the temple, there are very old trees towering, classical elegant, and tranquil, self-becoming a place of its own. Koxinga Shrine (Guoxingye’s Shrine), located by Kaishan Rd., Tainan and surrounded by trees, is the only Fujianese style shrine in Taiwan. This is the shrine built in memory of the work and achievement of Cheng-Kung Cheng, the pioneer of Taiwan. By the time Cheng was 21 years old, the Ming dynasty came to an end. In 1661, Cheng led his army crossing the Taiwan Strait and after 9-monthbattle, Cheng had finally retrieved Taiwan from the hands of the Dutch. After gaining access to Taiwan, Cheng quickly built up the whole place by setting up governing offices, regulations, education system, as well as developing more farm lands to improve the living standards of the local people. He also actively trained people in military tactics, preparing them to fight the Qing army. However, just half year after he had retrieved Taiwan, Cheng died of illness on May 8, 1662. His aim of rejuvenating the Ming Dynasty was unfulfilled which was the biggest regret of his whole life. Inside the Guoxingye’s Shrine, there is the Tainan Folk Cultural Hall where exhibits various historical culture of Tainan. 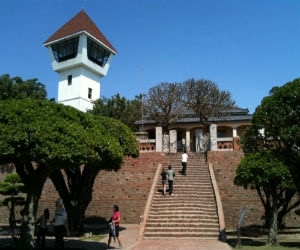 Anping Fort was built by Dutch in 1624, where has been the administrative center of the Dutch regime and the hub for trading. The building was originally constructed in square inner fortress and rectangle outer walls. The red bricks of the Fort have been taken for construction of Eternal Fortress. During the Japanese occupation, the Dutch style buildings in inner fortress were completely destroyed. A square red-bricked step platform was constructed with a western style house on the platform, being served as dormitory for Customs officials, where the memorial hall now is located. Anping Fort was registered to be the first grade historical replica and become an attraction for tourists. The remaining more than 70 meters long south walls of the outer fort with worn-out red bricks, accompanied by the old banyan roots, chanted its odyssey. The fort is the very historical replica over three hundred years. 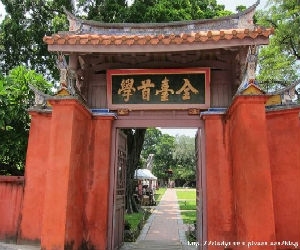 Anping Kaitai Matsu Temple is the biggest temple of Anping district. In 1661, Koxinga bring 3 god’s statues from Fuchien provience as the patron saint of the soldiers of Ming Dynasty. After Koxinga took over the Dutch to give up of Taiwan, in 1668, Qing Dynasty, they built a temple near the ocean and consecrated Matsu. At Japanese colonization in 1895, Japanese killed Qing’s soldiers in this temple and buried their bodies in here. The residents were afraid of their ghosts so this temple was neglected and the Japan changed to be a public school of Anping. The statues were put at several other temples in Anping. In 1966, Matsu Temple was re-built at present place. Yanping Old Street is also called “Taiwan Street” or “Flagstone Street” situated at the east of Anping fort. It is the first street built by the Dutch three hundred years ago. The scale is the same as Qing Dynasty’s rule, only 2~3 meters. Easy passed by pedestrian or bicycle but not for car. In 1994, suggested by local residents, the Tainan Government should expand the street but disagreed by the cultural supporters. Therefore the project had been stopped for a while until residents raised their request again. Finally, Yanping Street has been re-instructed with lots of stores for incense, candle, flour, and hand-made candied fruit. Old Tait & Co.Merchant House was founded in 1867. After Taiwan was ceded to Japan, the Japanese government took back the monopoly for opium and camphor. In 1911, all of the foreign firms in Anping were closed, and Japanese government turned Tait& Co. to a salt company. Until the restoration of Taiwan, it changed to the office of the Tainan Salt Works. In 1979, the city government took back Tait& Co. and repaired it as the Taiwan Development Wax Museum. The office of Tait & Co. is 200 feet long and 120 feet wide. Together with the Bain & Co., Bovd & Co., Julius Mannich & Co., and Wright & Co., they were known as the top five foreign companies in Anping. Different from our traditional building, the western designed buildings of these foreign companies are the providence of the trading history for Taiwan and foreign companies. Old Julius Mannich Merchant House is one of the 5 biggest foreign companies in Anping district from 1862 to 1893.After Taiwan was ceded to Japen in 1895, the Japanese government took back the monopoly for opium and camphor and only left sugar to them. The foreign companies business decreased dramatically. The Julius Mannich & Co. announced its closure. In 1901, Japanese government set up Tainan Hall, Anping Branch in here. And in 1920, Anping branch was dissolved and the original place became the Tainan Police Office, Anping Branch. After the restoration of Taiwan, once it was the dormitory of Salt Works. And after 1986, it was changed to the memorial hall of Anping Trading history to exhibit the relative documentation about the trading of Anping. Haishan Hostel was built by the troop from Hai-Tai town so it’s also called “Haitai Guan.” In 1895, Taiwan was ceded to Japan, these 5 hostels of Anping had lost their original function and were neglected. After the restoration of Taiwan, Haishan hostel become a residence and belong to the person named Zhang, Chang-Gang. In 1975, Tainan City Government bought this residence and turned it into “Anping Cultural Museum” to display Anping’s historical relics. The structure and style of Haishan Hostel is almost like a middle size residence. The entrance is located at the east. There are two door walls, one with lion patterns and another with characters, typical folk style. There is a Knife & Sword Screen between the main door and main hall that can cover the inside space and also ward off evils. The worshipping kiosk and the main hall have more decorations mainly in blue color. It also has a clay lion head sculpture. Anping Tree House is adjacent to the Tait & Co., and it was one the warehouse of Tait & Co. in the beginning. After the restoration of Taiwan, it was become the warehouse of Taiwan Salt Corp. It was fallen into disuse and the pagoda trees grown in there. Over half century, it formed a special scene with trees wind around the house. Because of this special scene, artists stopped here for some art activities. After Tainan city government repaired it in 2004, one can cross this tree house now by the wooden path with a childlike image to discover this funny space. The roots of the old pagoda tree hanging down from the damaged roofs makes it look like the wall is the support of the tree and the leaves are the cover of the roof. Lin Mo-Niang Park is donated by Chi-Mei culture Foundation and is around 2 hectares. The height of the statue is 16 meters plus the base is 4 meters that it has become the new landmark of Anping. Due to the special landforms of Lin Mo-Niang Park, the sunset and night views have become a new one of Tainan’s tourism. With the construction of Historic Harbor side Park including wooden path, water view and toilets, Lin Mo-Niang Park will become an international tourism providing the citizen a better and comfortable place. Eternal Golden Castle was built to resist the Japanese troops who invaded Taiwan due to Peony Suffix Event. On the construction form, Eternal Golden Castle is a square shape fort belonging to the western diamond type castle, with its four corners protruding and its center indenting. There are fosses around the fort, and the fort is placed with big and small cannons, while the center of the port is used as exercising field. Eternal Golden Castle can be seen as the important epoch-making milestone among all forts in Taiwan. The fort was ruined later on, and was once neglected, but later it was ranked among one of the noted sights in the Tainan city and was carefully reserved. After the restoration, a major reconstruction was carried out, the shape and the materials were more or less changed. Nowadays, the Eternal Golden Castle is ranked as first degree historic spot.